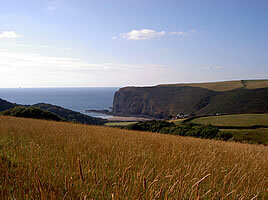 Bed & Breakfast and Holiday Cottages in Crackington Haven, near Bude, North Cornwall. As you approach Lower Tresmorn you will know that you have found that special place in an idyllic location. Close to the beaches of Crackington Haven and overlooking this rugged and yet beautiful stretch of the North Cornwall coast, owned and protected by the National Trust. You can stay as a guest in our ‘Highly Recommended’ Farmhouse Bed & Breakfast accommodation or in one of our uniquely special Self Catering Holiday Cottages. With the further delights of Bude and Boscastle nearby, your Cornish holiday choice is complete. You can stay in a choice of individually styled 6 bedrooms. Two en-suites and one with a private bathroom are in the farmhouse, accessed by a wonderful spiral stone staircase. A further three en-suite bedrooms are in the beautifully converted barn alongside the farmhouse. A welcoming fresh pot of tea and hot buttered saffron cake on your arrival and a wake call of our legendary farmhouse breakfast in the morning completes your experience. 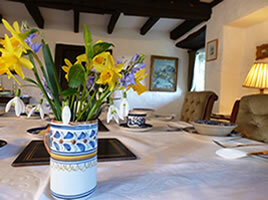 We offer a choice of three uniquely special holiday cottages to suit all tastes and number of guests. 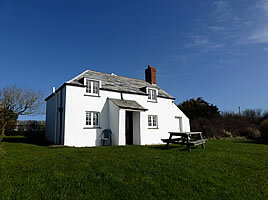 Lower Tresmorn Cottage sleeps up to four guests. Mealhouse is a large barn conversion sleeping up to nine guests. Lastly Pen Cliff, a wonderful wooden chalet on the side of the cliff with unrivalled views of Crackington Haven and beach. Whether it is the magic of Tintagel, the romantic tranquillity of maritime Clovelly, the unspoilt beauty of Port Isaac (the idyllic fishing village popularised by Doc Martin), the surfing beaches of Bude, Widemouth Bay, Crackington Haven & Polzeath, the wondrous Biomes of The Eden project or the ingenuity of the Lost Gardens of Heligan. Alternatively your choice may be to take a short stroll or more challenging hike along the many coastal paths or inland tracks North Cornwall has to offer. You will never forget your stay at Lower Tresmorn. 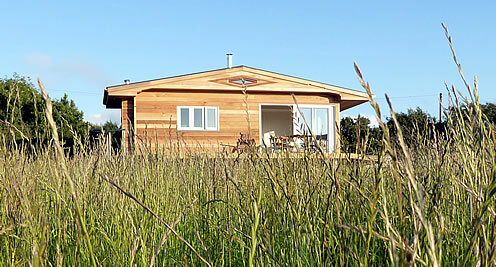 Our luxury cabin for 2 is the ideal choice for those who want to be close to nature and experience the peace and tranquillity of the North Cornwall Coast and countryside. Enjoy total seclusion in our small well equipped and comfortable wooden cabin. Relax and watch the sun setting whilst sipping a glass of wine.